The Olde English Bulldogge originated in England between 1600 and 1700. These were the early ancestors to many of the Bull breeds that exist today including the English Bulldog and the American Bulldog. They were bred to participate in blood sports like bull baiting. This so called sport, became quite popular in England through out the middle of the 18th Century. Bull baiting primarily consisted of staking out a bull and allowing several Bulldogges to attack it. A dog of great courage and agility was needed for bull baiting. This dog was of medium size; larger dogs were considered to be the result of mastiff crosses. Around 1835, laws were passed in England prohibiting bull baiting and the Olde English Bulldogges main purpose of existence vanished. Within a decade the numbers of bulldogs declined drastically almost to extinction. Dog show fanciers eventually decided to reconstruct the breed, but wanted to tone down the aggressive temperament of the original Olde English Bulldogge. They crossed the remnants of the existing stock with other breeds and over the years that followed they developed the modern English Bulldog. Unfortunately though, this modern dog is wrought with all kinds of genetic health problems. The modern Olde English Bulldogge is a reconstruction of the original Olde Bulldogge of the 17th and 18th century. Various genetic crosses have been used in carefully and thoughtfully planned breeding programs to obtain this goal. The foundation of most of today’s Olde English Bulldogges can be traced to English Bulldog, American Bulldog, APBT and Mastiff. 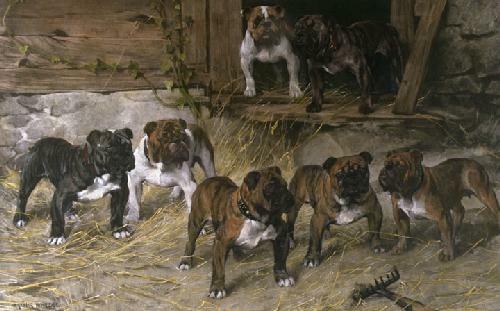 These various dog breeds were used very selectively in various combinations to obtain the desired physical traits of the original Olde English Bulldogge. The result has been a good looking Bulldogge of great athletic ability that is much healthier and physically fit without most or all of the problems that plague many of today’s modern English Bulldogs. The goal of all Olde English Bulldogge breeders should be to produce genetically healthier Bulldogges that are free breathers, free breeders, and free whelpers. Olde English Bulldogges are docile, but capable and protective, fearless and athletic, fierce-looking, determined and courageous, bold and friendly around their family and friends, but fearless adversaries to anyone who threatens their masters or property. This breed likes to chew and should be supplied with plenty of toys and bones. Nylabones and rubber Kong toys are highly recommended. Rawhides, soft rubber and stuffed toys are unsafe, for they are easily shredded or swallowed whole. Olde English Bulldogges are so eager to please that they may overexert themselves in an effort to do whatever is asked of them. An owner who displays a natural authority toward the dog, socialization and obedience training are important. It is best to channel high energy individuals to some type of work and exercise. The objective in training this dog is to achieve pack leader status. It is a natural instinct for a dog to have an order in its pack. When we humans live with dogs, we become their pack. The entire pack cooperates under a single leader. Lines are clearly defined and rules are set. Because a dog communicates his displeasure with growling and eventually biting, all other humans MUST be higher up in the order than the dog. The humans must be the ones making the decisions, not the dogs. That is the only way your relationship with your dog can be a complete success. This breed tends to drool and slobber. Lifespan is between 10 and 14 years.